My last post, that is. And my post before that was like 12 years prior. Both times I threatened that I would be back and posting regularly. Ya, well clearly THOSE were empty threats. But here I am!!! Smack dab in the 2nd full week of summer. Summer to me is kinda like New Years. A time for a clean slate and lofty to-dos. "Oh I really should...." but the motivation behind that list is always lacking because who really likes guilt. Am I right? #1 is that I don't take hardly ANY pictures when I am not blogging. Besides the typical birthdays/holidays/vacations picture events. I so miss the random life moments that I used to photograph...when I blogged. SO much happens between the birthdays/holidays/vacations that I want to remember. Also tangled up in this particular revelation is that I want to continue to scrapbook in some form or fashion. This falls onto the guilt list. I have not scrapbooked in 3 years. Sigh. Have to find the scrapbooking medium that fits my life right now. No guilt. All of that in a nutshell...no pictures = no scrapbook. Blog makes me take pictures. Must blog. #2 My Dad loves my blog. My Dad is one of the greatest guys on earth. Simple, huh? Hi Dad! #3 The obvious narcissistic personality that on some scale all bloggers must posses? Life is beautiful and crazy and entertaining and sometimes I crack myself up... and like to write about it. #4 I have TIME to blog now!!! The long and short of it.... 3 years ago we moved 90 miles from "home" to this fantastic small-ish town where hubs opened a used car lot. He was wildly successful and loved it. I was working 2-ish days a week at the lot as the office manager extraordinaire. Our business partner turned out to not have the same work ethic/drive/standards as hubs. He walked out last June and then proceeded to try and extort money from us and then "procured" a large sum of money from our business account later in the year. The hubster and I buckled down and put all of our money/energy/time into our business. All the while making a concentrated effort to keep bitterness out of our hearts and praying that our God would provide the path for us to follow and remedy the situation in His time. In a nut shell, I for all intents and purposes became the full-time partner. Therefore no time for blogging or being a housewife. I have to commend full time working moms. I believe they wear capes! Despite the upheaval and unknown of where our business would go, hubs and I made a great team and it enhanced our marriage and our business continued to succeed. My man is an incredible businessman and provider for our family. I could not be more proud of him. Months passed as we worked hard and tried to be patient while we waited for God's answer. The answer came last month when a large dealership in a town about 60 miles away, that hubs has done business with for years, randomly called and offered him a job. A job as the fleet manager. Which involves him traveling all around our area. We don't have to move. He has a lovely salary, benefits, a vehicle and is doing what he loves with a passion...blah, blah, blah. All of that and no headache of owning our own business with a smarmy business partner that would not go away. That all leaves me gainfully unemployed. To which I say....HOORAH!! I love being at home and taking care of my family. So here I am! After the harrowing minutes this morning realizing I forgot my blog password and trying to figure out which email address used ...I gave google blogger a blood sample and fingerprints, now I am back in business! Lots has happened since last August but here is the top of the list. 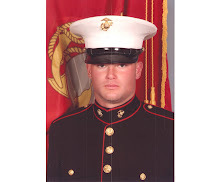 In April we drove to Arizona to welcome The Marine home from Afghanistan. The Marine and one happy darling-daughter-in-law!! I was one elated mom. Best day ever. Hubs...with a BIG sigh of relief! Blonde rascal has his brother back, all is right with the world! I pray for the safe return of all of our service men and women. Every military family deserves the indescribable joy of a deployment return! I renewed my sewing mojo when I went on a weekend quilting retreat back in April. I took a Santa kit, to work on, that I have had in the wings since... the beginning of time more or less. He turned out quite cute, if I do say so myself. I hung him haphazardly in the living room, in August, to see how he looked. Santa looked like it was too hot outside to have him on the wall. Now he is hanging comfortably in a closet... for another month or two. It felt great to get that quilt finished. Santa was followed by a log cabin that was part of a quilt along at our local quilt store. It is stripey and dottie and just wonderfully crazy. At this point I swore I would never do another log cabin as this is possibly the most un-square quilt I have ever made. I quickly forgot that vow when I saw the coolest log cabin that is an American flag. I may have to make it for the marine. If he can fight for our country...I can surely suffer through another wonky log cabin, right? Then I did 2 little tunics for my precious twin nieces. I have not sewn clothes since I was in college. I may not ever sew clothes again. These sweet little tops had shorts that went with them. I won't even go in to the comedy of errors that was me attempting... and then scratching the shorts idea. Next on the agenda is making a slip cover for my darling daughter-in-law. It if a funky junk store chair that I am going to slip cover with cotton seed bags. She is going to put it in her sun room. I am waiting until a day when I feel I have sufficient brain power to start that project. After the shorts debacle, my confidence is temporarily, I hope, waning. These spurts of creative energy are usually followed by fits of rearranging and reorganizing of the Quilty Shack. Can you tell it has been a scorcher of a West TX summer? Here the little shack is earlier in the summer when the geraniums were slightly more happy and everything was a little less dusty. There is always a plethora of animals hanging around the Q.S. Missy, ever in the center of activity. Then Jake, ...who earlier in the summer dug up my cute little flower beds in front of the Q.S., looking for a cool spot. Darling. Of course Bianca... ...the sweet Bordie Collie who is in dire need of some sort of spa day. Opening the door to the QS, always to be met by cluttered chaos that creativity generally creates. Off to the left is lots of storage spots, my cutting table and dresser turned ironing board. The. Best. Junk. Store. Find. Ever. Old metal school lockers. Spray painted pink, what else? The storage capacity of lockers is stellar. Back up at the front, past the dresser, is my sewing machine. It is parked on an old wooden and enamel table that belonged to hub's grandmother. Keep going to the left is a bulky cabinet with more great storage capacity... Keep in mind that this photo shoot was not staged. It is real life in the Quilty Shack...complete with pictures that have fallen off the wall and everything. Next to incredible hulk cabinet, is my junk store (sense a pattern here?) cart, which I left in its original chippy yellow paint condition. Above it is an old wooden ironing board which also belonged to hub's grandmother, that is currently being used as a bulletin board, if you will. ...an electric hot water kettle thing, Starbucks instant coffee and a Scentsy warmer to make things smell fab. A ridiculous amount of quilting magazines and an old school set of canisters, which were found at the junk store too. Why do you ask? In the canisters are some people snacks, along with kitty and doggie treats. You saw the unruly gathering of animals hanging around, and that was not even the half of them, they get hungry. Missy has quickly caught on to the snack stash....and is obsessed. All the puppy treats were gone...so she polished off the kitty treats. Meow. Lastly we have my newly appointed scrapbook desk, which is still under construction and organization efforts... I have not scrapbooked in some 3 or 4 years sadly, nor have I printed the 60,987 pictures on my computer. But, as you can see I am working on that. In theory anyway. Also you will see I painted the bathroom door with chalkboard paint. Good times. Now, Missy is bored so I guess I better go. So, my last post was 6 days in to summer. Yesterday was the first day of school. Where did you go summer? I love summer because I love blonde rascal being at home with me. End of story. Let's review his unwillingness to be photographed on the first day of school, shall we? Ending with a smirk as he makes his escape and runs for the car. On a side note, back to school time does give me hope that cold weather is scheduled to appear in the next few months. I am a winter girl. Bring on the cold and the dark at 6pm and the quilts to snuggle under and the fires in the fireplace and the hot chocolate and snow and rain and icy windshields and cold toes and....well all of it! West Texas has had a HECK of a summer. Over 100 degrees for some ridiculous record # of days. 50 or 60 days. Sweating is so unattractive. No rain....since almost going on a year now. Honestly. We have gotten a quick rain shower, 10 minutes at a time maybe twice this summer. It is bad. Brown, dead, ugly bad. SO all you summer lovers (Mary) I have paid my dues to summer weather. It better snow, rain, sleet, hail whatever it has to do for a little precipitation in this parched country, this winter. And cold? Bring it. We have had extreme heat....so I feel like a little extreme cold is only fair. I'm just warning you. I have sweat like a stuck pig all summer, so conversely it is time to freeze the proverbial tushies off this winter. Mmmmhmmm that's right. So let's talk about blonde rascal and how he is in the 6th grade now? Why does it go so fast? He is half way through his schooling....well K-12 that is, because he will be going to MIT or Harvard or Yale or wherever his little heart desires, except the University of Texas because we bleed Red Raider in this house.....but I digress. Thank goodness in this little bitty school that he attends, 6th grade is still elementary. My heart is not ready for jr. high. I have this one year left to make snacks for the class, gifts for the teacher, attend class parties....and I plan on fully embracing it! Sunday at church, he went from Sunday School to Youth Group. Ack. My baby. The up side of that is that both hubs and I reminisce fondly about our experiences with our respective church "youth groups" growing up and how it holds some of the most fantastic memories. Oh the fun. In fact hubs is still very, very close to this day to the band of thieves friends from his youth group. We are excited for the good times in store for blonde rascal. 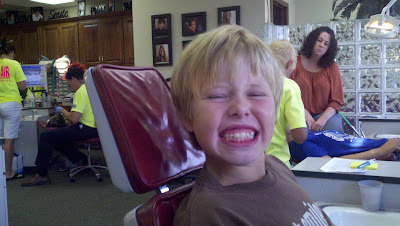 My Dad requested a showing of the first day of school pics so that they could see blonde rascal's new brace-free smile! Well as it turns out the first day of school pics were apparently too early in the morning to, well, smile. That would be me, hubs, the marine, darling-daughter-in-law and a brace free blonde rascal getting ready to brave the water park... which I am hoping is a good excuse for why I sort of look like a drowned something or other in clearly the most unflattering swimsuit cover-up known to man which will promptly be donated to Goodwill. Ahem. But isn't my new daughter-in-love cute??!! And finally for your viewing pleasure, Dad, a full on mouth view whilst at the orthodontist immediately following the brace removal.... Charming, eh? School has been out for one week. Bliss. This momma loves summer. I love not having a to stick to a stringent schedule and necessary bedtimes and homework. Last day of school, blonde rascal getting his honor roll medal. That's right my boy has it all, brains and good looks. *I had to laugh because I got some comments on my last post from people who had considered putting in a pool, and I have caused them to ponder on that idea. Here is the standard that you must accept if you decide to put in a pool... you have to digest and know as the gospel truth that it IS expensive and the upkeep is time consuming... always, every summer, no breaks. If you think the payoff is worth sinking your money and time into.....then go for it. If not then join a country club, neighborhood pool or make friends with other poor schmucks who have pools. Come visit me and swim to your hearts desire! *Elmo is a baby daddy. Sassy is the baby mama. A fine couple, yes? They had 4 pretty babies. More on that later. We still can't catch the little rascals in order to photograph their cute selves. *In April I went on a weekend quilt retreat with our local quilt store and it was dreamy. Between LOTs of eating and laughing, I did get some work done. I'll show ya later. *We took blonde rascal and his BFF to Great Wolf Lodge in Dallas for his 11th birthday. My baby boy is 11? He is my greatest joy in life. In a fit of laughter on the floor, above. He is regular character, that one. How is he big enough to be shooting guns? Blonde Rascal's birthday is May 9th, which always hits on or near Mom's Day. Which is fine with me. I mean, what better way to celebrate Mother's Day than with the little man who made me a mom? So, we were in Dallas for b.r. 's birthday and Mother's Day. On Sunday, Mother's Day the boys took me to Bass Pro Shop. Just exactly how many fishing lures and varieties of bullets are there? Painful is what that was.